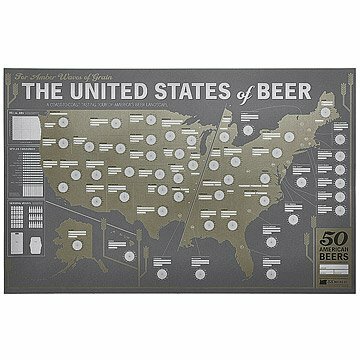 This beer-lover's design allows you to sip from sea to shining sea and honor your favorite hops. Celebrate America's amber waves of grain, as well as their finest amber ales. Each state on this hop-friendly map offers a spot to list your favorite local brewer, the date you tried it, and a flavor wheel to gauge your taste. Whether you're on a cross-country road trip or sampling some of America's finest from the comfort of your couch, this beer-lover's design allows you to sip from sea to shining sea and honor your favorite hops. Made in Portland, OR. "I have a hop vine tattoo covering most of my right arm," says bigtime beer geek Dave Selden. (We could stop his bio right here, obviously, but let’s continue.) Born and raised in Iowa, Dave went to art school, detoured through journalism school and finished college with two degrees in three years. The first job he landed was in Portland, Oregon, and he’s been a graphic designer, mostly in advertising, ever since. "After hours," he says, "I did what most people who work in advertising do—I drank. And then I blogged about it." PR firms began inviting him to "beer events," and he needed a way to keep track of his tasting notes after trying over a dozen beers in one night. He put his visual skills to work and created a beer tasting journal. Are you surprised that a guy with a hop vine tattoo made one especially for IPAs and other hoppy beers? Neither were we. We bought this gift for my Father-in-Law since he travels and loves to try new beers and it was a total hit! The only downside is that the size is a little funky to frame if you wanted to hang it. Can travel the states to go taste beers. Perfect gift for a beer lover! Love the product itself! Disappointed in the condition I received it in. My husband and I love to travel, so I thought this would be a great and unique addition for our travel goals. He loves beer, which made it a great present for him, and he's even more excited about traveling the U.S. Very good quality paper, but it does lack some more vividness in color. It's almost a little dull at first glance, but once you actually look at it, you see all the detail and words on the map. This was the perfect gift for my boyfriend. We love to travel and taste local beers. The paper is beautiful and will look great in our family room once we have it framed. This gift is great for beer lovers that love to travel! I bought this product as a gift for my husband. We travel a lot and he loves craft beers. This will be a fun way to preserve memories. Makes trying new beers fun to keep track of. Boyfriend loved it.